I’ve been torturing my family for years, forcing them to drink the sometimes often dreadful concoctions that I formulate from a deranged aggregate of ingredients — adding a little of this and a little of that — sometimes palatable, sometimes not. While the raw Cauliflower-Brussel Sprouts Smoothie was NOT a winner, I think I’ve finally developed the perfectly Ultimate Smoothie. Nonfat yogurt, regular or Greek for more protein or soy/hemp/almond milk for vegan. I throw it all in the blender and process until very smooth. You’ll never taste the greens or the beets, but they add a bright undertone to the fruit. If you have a lime or a lemon, add a squeeze or two. I have a friend who tosses in a whole orange, peel and all, from her own organically grown tree. I’ve never done that, but it’s certainly an option. Whether you try my smoothie as a meal replacement (like I do) or as a healthy between-meal snack, my Ultimate Smoothie will provide added energy and lots of nutrition for your busy day. P.S. Yes, I use a lot of ingredients, but it’s still easy to do and can be made anywhere if you have a blender or even an immersion blender. I hate swallowing vitamins and supplements but the smooth and creamy texture of my ultimate smoothie helps them go down without gagging. Since I’ve been taking Garden of Life Kind Organics supplements, I feel so good and it’s really helped with my digestive issues (and my son is a fan, too!) I’m a big believer in pre and pro-biotics, balancing intestinal flora and fauna, and you remember I’m a junkie for wheat grass! My tugboat man and son have the same routine, but theirs is especially formulated for men. So…by now y’all are aware that I went all whiny and whingy at BlogHer14, but I came away with a few positives, like meeting the awesome reps from Garden of Life Kind Organics. It’s raw, vegan and gluten free. One serving has 17 grams of raw plant based protein. 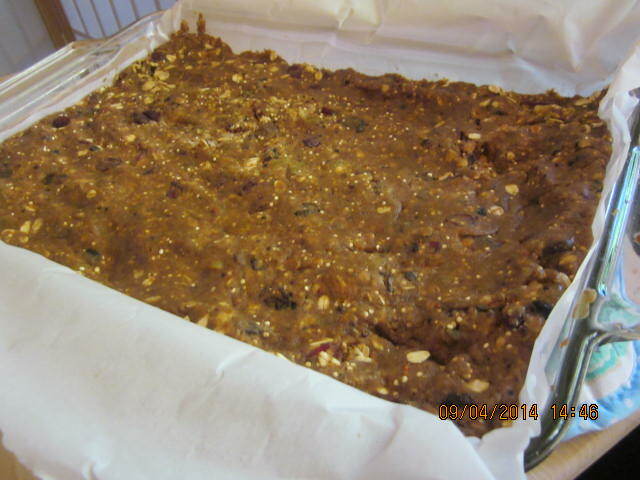 My family loves my protein bars — I’m on a constant quest experimenting with different recipes to pack as many nutrients as possible in every bite, and THIS one is so good, it could be a meal replacement bar, too. There are a lot of ingredients, but don’t let that scare you; it makes enough to last a long time. 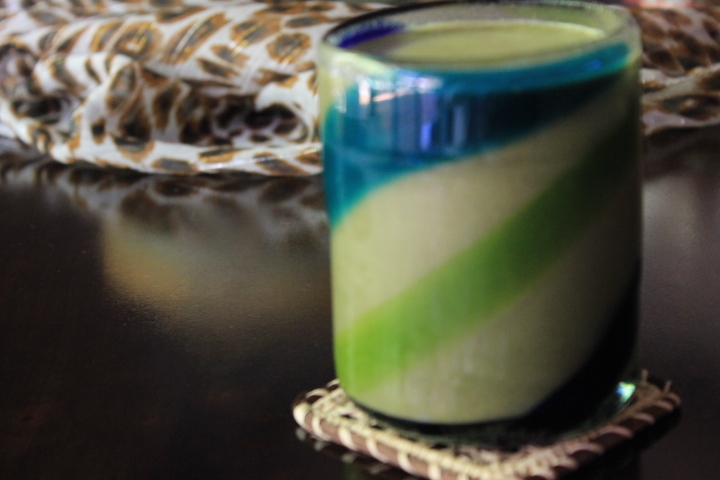 This recipe uses Garden of Life Raw Protein in Vanilla, but you could use any flavor. Chocolate would be DELICOUS, and if you use that, add 1/2 cup cocoa to the dry ingredients. We call them “Bomber Bars” ‘cos “bomber” is a term for an awesome wave. In my family, everyone but me surfs, and this is a great snack when you’ve burned all those calories in the water. 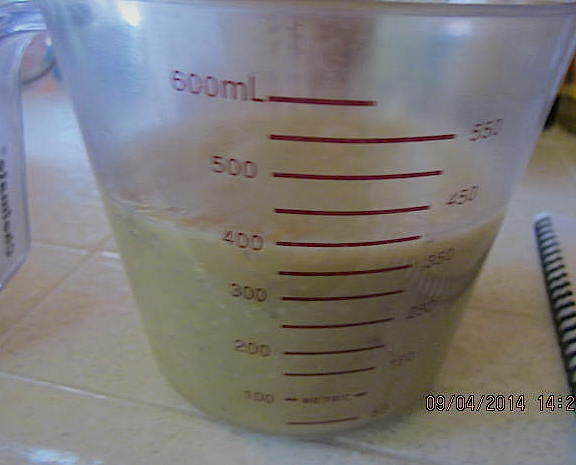 Cook until soft, about thirty minutes, then mash or use immersion blender. Set aside. In a really big bowl, combine the first ten dry ingredients, whisk to stir and set aside. 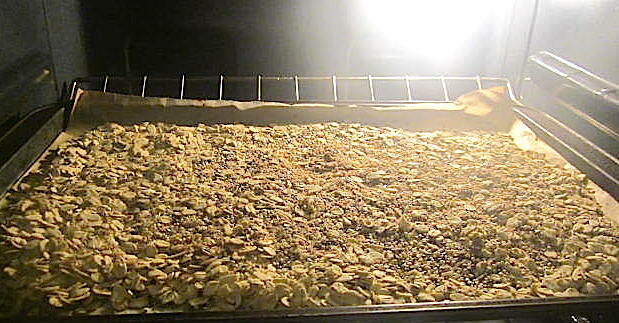 Combine the quinoa, chia, flax, coconut, oats, and almonds on a baking sheet. Bake for 5-10 minutes @350 degrees until lightly browned. in a large pot, mix the peanut butter and maple syrup together and bring to a boil. Remove from heat and stir in the rice bran, salt, cinnamon, allspice, cardamom, ginger, and vanilla extract. 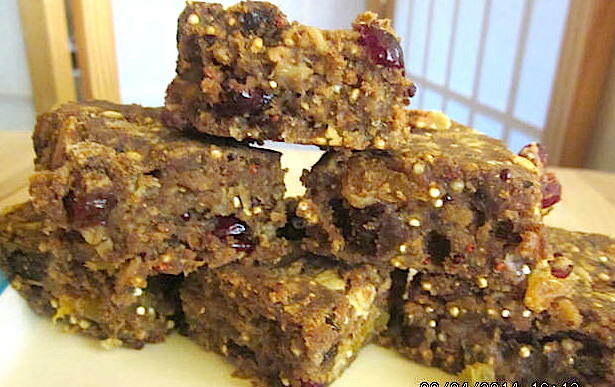 Combine the lentils with quinoa/oats/almonds mixture with dry ingredients that were set aside. Whisk to mix. 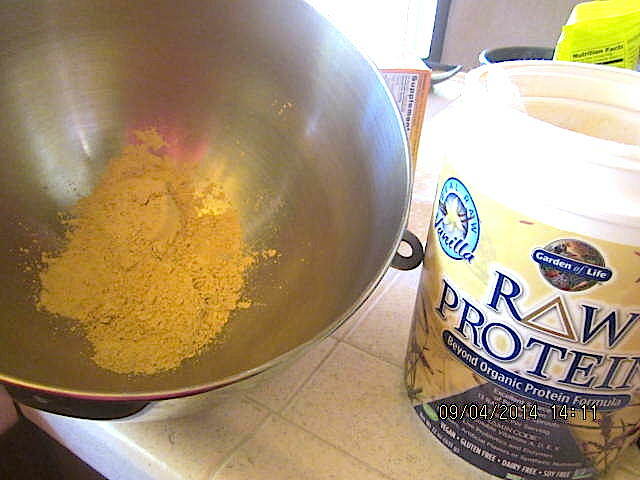 Pour the peanut butter/maple syrup mixture into the bowl with dry ingredients, add oil and egg (if used). Add cooked, mashed lentils. Mix well with wooden spoon to completely incorporate. Add fruit. At this point, I use my hands to mix it all together. The mixture is a bit heavy and thanks to the maple syrup, it should stick together, so you may need to slightly moisten hands as you go. Line a 13×9 pan with parchment paper, leaving enough hanging over the sides so you can lift it out after it bakes and cools. Pour the (heavy) mixture into the pan and press down firmly. *This is a super important step. When my tugboat man is home, this is his job. When he’s not here, I use a one-pound can to roll back and forth until it’s a flat and mooshed(?) together as possible. Pack it down to ensure it fills each corner and creates an even, flat surface. Bake at 350 degrees for about thirty-forty minutes. Remove from oven, and press down again. 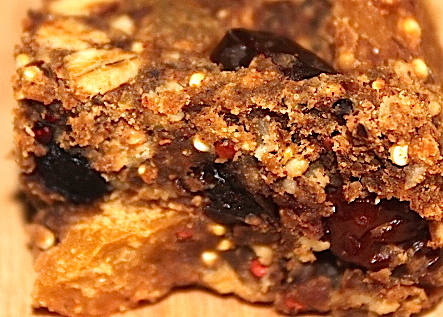 The more dense the bar, the less crumbly it’ll be. Let cool, refrigerate for at least two hours. Cut into 2×2 inch squares. To keep them fresher longer, I wrap each individually in parchment paper and always refrigerated. One of these bars is a protein packed “bomber” that’s a perfect snack or even meal replacement. My son needs to eat several small meals with high quality nutrition and these are perfect for his busy, on-the-go lifestyle. I’m happy because I know my family is eating healthy food made with love.